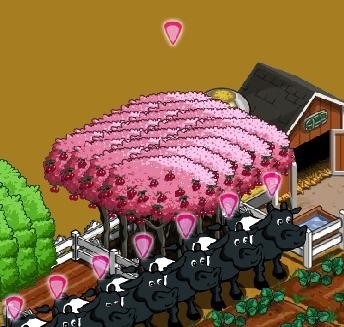 Everything you need to know about the FarmVille Orchards and how to Master Trees in FarmVille! Place the orchard! It will take up 4x5 units on your farm. Build it for 10 boards, nails and bricks. Then fill it with trees! 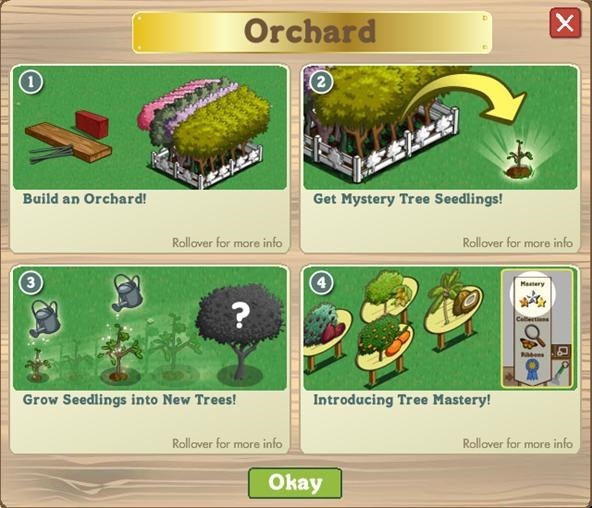 Each 2 days you can harvest the orchard and sometimes get mystery tree seedlings. Use 10 watering cans to grow them into new trees. Fill up your orchards, then look inside and hover over each tree to see what seeds it will produce! When you get a mystery seed, it will be in your gift box. Place it on your farm then click 'use' on your watering cans. 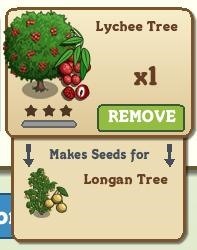 You will need to water each seedling 10 times for it to become a full grown tree. You can put in as many of each tree as you want up to 20 capacity, or 20 single trees of different types. Click the arrows right and left to see your other trees. To unlock a new Orchard to buy and build, you must complete the one on your farm. You can buy UNLIMITED ORCHARDS as long as you always finish one before you start the next. Place your seedlings 1 at a time and grow one completely before you place the next one or it will be more work for you to get the watering can and select the tree you want to water and click on it. Make sure you gift watering cans and trees to your neighbors! 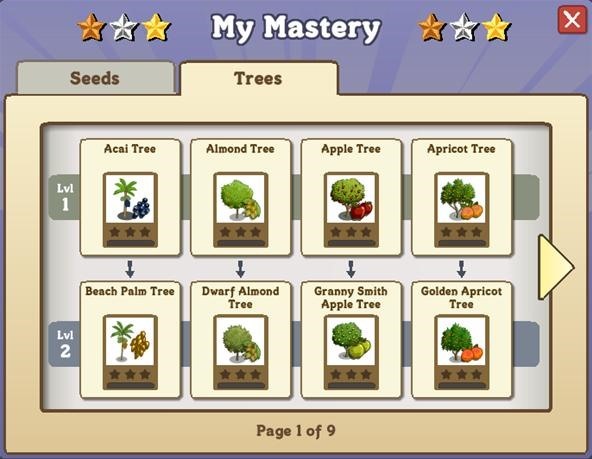 Check the "my mastery" screen for your crop mastery and tree mastery progress! 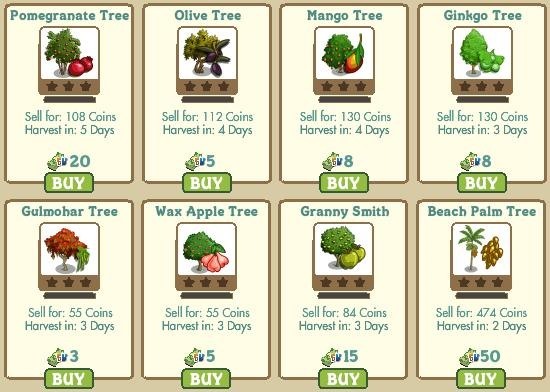 You can buy most of the trees for coins or farm cash. Keep in mind that many of these trees are FREE GIFTS, so you can ask your neighbors for them to help with your mastery. 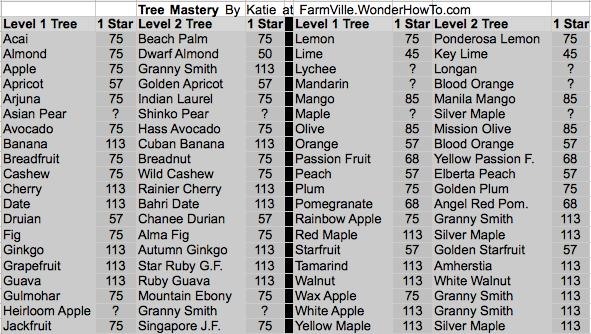 Here is a list of all the trees, how many times you will need to harvest them to get 1 star mastery, and what new mystery trees they will produce! You are missing the Coconut tree (was 3 FC sometime in the past year - can't remember when, but I have 10 of them) It produces the Golden Malayan Coconut tree. There are some you can only buy for cash in the market, but still a few for coins. Some are free gifts and some come in the mystery gift. PLEASE help me... Do the new trees go into an Orchard. They give Master but do they give seedlings if they're in the Orchard? I do not want to waste the Orchard space if they have no use in an Orchard. I have tried all the forums and cannot find this answer. Thanks you..
yes. and yes they give seedlings for the level 2. Thank you. Have the level 2 trees been announced? Would it be best to put trees into the orchard with the same time to harvest? Should orchards be all the same tree, mix trees up with several species, or put in 1/12 one kind and the other half a different tree? Why haven't the Ajuna, Jacaranda, Mangrove, Flourishing Birch, Beech and White Pine been included? I see that the Bubble Gum Tree and Cotton Candy have been included. Thank you for your previous response. yes, the level 2 trees are out and in the game. you get them whenever you grow up a seedling. i'm keeping all my trees in orchards for now, because i want more trees so i can master everything. it's up to you and your decorating scheme if you want to do something else, but i think this is the most effective way to maximize profits. The decoration trees DO NOT go in orchards, they are not harvestable.. completely different item there. @Katie.. Decoration trees? Like cotton candy and snow cone? These two WILL NOT give more of the same kind of trees? Please confirm.... I also have bubble gum in an orchard by itself.. will bubble gum produce a bubble gum sapling? Does a tree have to be in the orchard to produce a sapling? Just harvesting on your farm just gives coins and mastery.. is that correct? No. Cotton candy and snow cone will give you bubble gum. Decor trees are like the jacaranda, magnolia, mangrove, etc. Things that don't harvest. Yes, bubble gum becomes bubble gum. Yes it must be in the orchard to make sapling. You can harvest it on the farm or in the orchard for mastery. So would an orchard harvest in 2 days even if it only contains 'harvest in 5 days' trees? Why won't my Persimmon trees (which are harvestable) from the 7-11 promotion go into an orchard? Any help would be greatly appreciated. THANKS! You may have found that the tree can be mastered but FV never added it to the list of masterable trees so you will never get a mastery sign. You also cannot get baby trees as they never developed one for that tree type. You cannot put it into an orchard either. Has anyone figured out why some orchards harvest more often than every two days? I have several that harvest as often as daily, and I'm not sure why. Combination of trees and the variations of when they harvest? I see on here that several people have asked the same questions, but I find no answer as of yet -- I'm still curious . . . I'm nearly 100% certain that orchards are all exactly 2 days. I don't see that question unanswered above either. If you continue seeing problems with your orchards, you should contact zynga support or maybe check the official forums. I'm having a bit of a problem with the Jackfruit tree. I have on my farm, and even in the orchard, as well as the Level 2 Singapore. My problem is that it'sno showing up in the Mastery! I was trying to see how far along I was and I couldn't find that tree. The tree mastery list was in alpha. order before, and still is, but backwards. So, it's supposed to go between lemon tree and heirloom apple, but not there. Can someone help me??? I don't know what's going on. Sometimes the coding gets funky on the mastery page. 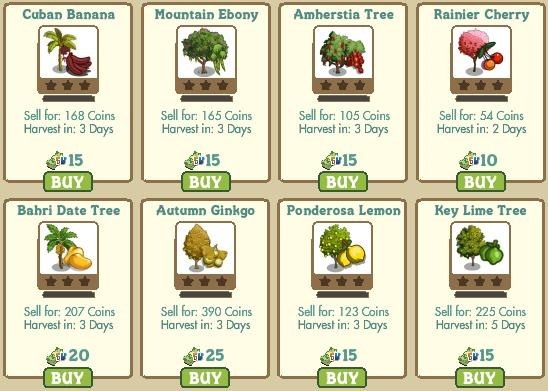 You might be able to see your progress for it in the market, either on the seeds and trees general, or just trees tab. Lets say you have two orchards that are on opposite harvest days, Could you take out the trees after you harvest them and put them in the other orchard thats ready the next day?? If a 5 day tree can be harvested in two days because thats the orchards time table it doesn;t seem ridiculous to wonder this-If so we could all get our tree masteries faster. L'arbre le plus rentable à ma connaissance est le GINKO AUTOMNE ! quelqu'un peut me dire pour les autres , sur le tableau il n'y a pas tout ! merci ! I remember seeing a list which show the exact amount of profit which each tree yielded when harvested. Unfortunately, I can' t find it any more. Does anybody know this or any other list with this information ? Katie, you have made my - playing - life easier - thanks to the FV extender I get my gifts more quickly and thanks to the horse stable harvesting trick I advance more quickly in levels. Many thanks. I bought and placed a caramel apple tree in my orchard but it won't register any harvests. When I try to remove it my farm goes out of sync. Anyone else have similar problems? I need help I can't add seedlings to my orchard. Nancy you can only put grown trees in the orchard. I cannot find how to purchase another orchard. Where in the marketplace is it? I'm searching for a foundation but don't see it anywhere. Clicking within the orchard doesn't seem to produce any solutions either. Jeff, it's under market> buildings>storage. There is a farmcash and coin option. You can only build one orchard at a time. Yes, you can sell your trees whenever you'd like to. You will not lose any harvest counts or mastery level. Do mastered trees provide xp when harvested, just as the crops do... and if not, don't you think they should? Yes,i too would like to know this. I have been searching high and low on the web for a definative answer, and all i can work out at present, is : 1) you get xp when you plant. and there seems to be no regular xp on harvest, only mastery points. Is this correct? Do you need to keep all your trees and orchards after you master them, Or can you get rid of them to make more room on your farm? 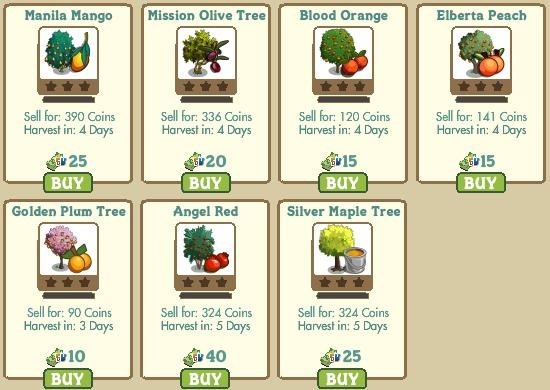 My orchards vary between 3000 and 7000 coins at harvest time. 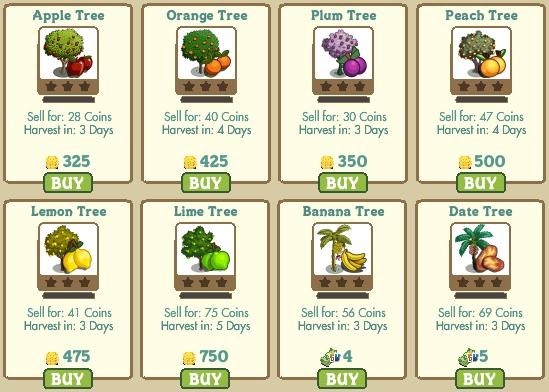 I don't try to make rows of the same type of tree, but I'd like to know which trees are responsible for the higher count so I can sell the others and try to duplicate this success with future orchards (after mastery is accomplished for all trees, of course). Does anyone have any suggestions for making this happen? 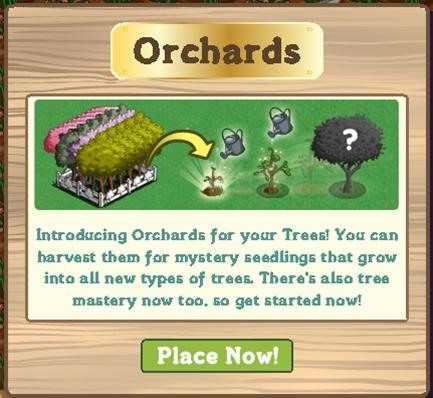 If I have 4 apple trees in an orchard and I harvest....do I get 4 harvest points toward mastery or just one? I would like to know how I can make my own trees, I see alot of people making there own trees, Anybody have any idea on how to do this, ?